Edge Magazine’s Jason Killingsworth interviewed me at some length about my history with videogames, from Apple ][+ to Atari to arcades, with notes on Zynga, DRM, piracy and the Humble Bundles. 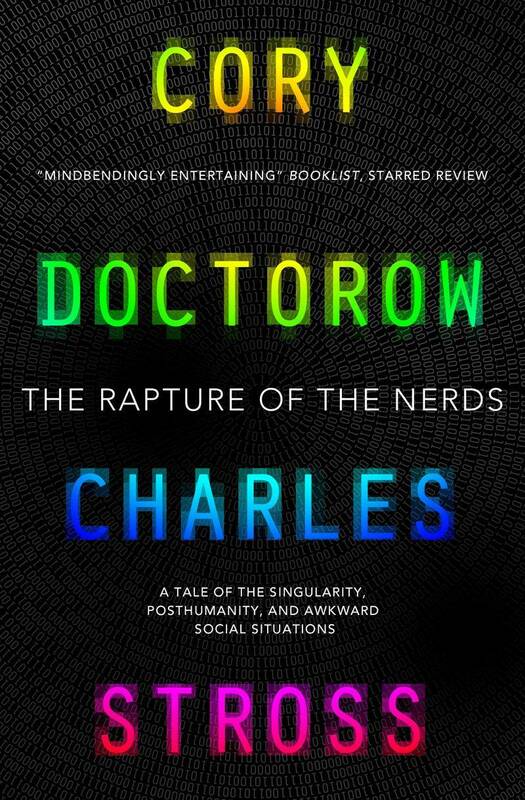 Well, this is fabulous news: Rapture of the Nerds, the novel Charlie Stross and I published last year, is a finalist for the 2013 Campbell Award for best novel. It’s in some truly outstanding company, too — check out that shortlist! The 43d Locus Poll and Survey is open for your picks of the best science fiction and fantasy of the past year, as well as your survey answers (Locus has been collecting detailed statistical information about science fiction readers for, well, 43 years now). You needn’t be a subscriber to fill in the survey, though subscribers’ votes are weighted more heavily in the awards. I’d be remiss if I failed to mention that I have two books on the ballot this year: Rapture of the Nerds (with Charlie Stross) and Pirate Cinema; they’re in some very good company as well. Designing book covers is the best job in the goddamn world. If you’re lucky, like we are at Amazing15, you get to work with incredibly talented and lovely people, on some of the most fiendishly interesting projects you can’t even begin to imagine without the aid of viralised nootropics. When the incredibly talented and lovely Cath at Titan Books asked us to design the UK cover for Cory Doctorow and Charles Stross’ The Rapture of the Nerds we braced ourselves. If you haven’t read it, do it now. The book is a melting pot of brain-warping ideas, every time you think you get a handle on what it is, what it means, it shifts in your hands like an organic Rubik’s cube. Books which can manipulate reality aren’t easy to design covers for. When you start a new project there’s generally two initial ways in: 1) you step into it and find a moment, a scene, an element and pin your cover design on that or 2) you step back and look at the overall picture – try and find the theme. But what do you do when that picture seems to keep changing? The answer is, you keep chasing it. And what happens when there’s other people involved in the process, each of whom has their *own* take on the book, a take which fluctuates as wildly as your own? The answer is you chase even harder and you don’t look back. The first ideas we turned in were turned down. They looked non-fiction (v2), or too young (v3). Version 4 hung around for a while but it quickly became too *normal* and that’s just not something the novel is, so we threw it out. We fiddled with icons and graphics (v5, v6) and impossible shapes (v7) to match the impossible shape of the story but each time the book out-thought us and proved us wrong. Version 8 hung around for a while, but it still didn’t feel *right* dammit, it felt like a good book cover but Nerds isn’t *just* a ‘good book’, it’s so much more than that. For a while there we lost the plot entirely (v9 was so wrong it had to be fired into the heart of the sun to destroy it), and when we came back up we played with colours and abstract patterns like madmen. Version 10 and 13 had something – after weeks of getting dirty with angry covers that weren’t right we liked the simple cleanliness and easy lines. It felt like a breath of fresh air. It felt like The Rapture of the Nerds. We chased harder. We imagined a bright spectrum filtered through a fractured pattern, clean fonts with nothing to hide. We got close. We kept the chaos subtle, a radiation of binary noise printed in spot varnish so you can only see it in angled light but you can feel it all the time under your fingertips. We got close and we caught it (v15). It wasn’t easy, but if it gets easy, you’re doing it wrong. We’ve just finished designing the covers to Doctorow’s Pirate Cinema and Homeland. Designing book covers is the best job in the goddamn world. Hey, Londoners! A reminder that I’ll be signing the UK edition of Charlie Stross’s and my novel Rapture of the Nerds, tomorrow at 1PM at Forbidden Planet. Charlie can’t make it, so I have fashioned a cunning 3D printed Space Marine Stross to accompany me, which you may rub for good luck if you attend. I’m at Forbidden Planet London with Rapture of the Nerds this Saturday! Hey, Londoners! A quick reminder that I’ll be signing the new UK edition of Rapture of the Nerds this Saturday at Forbidden Planet on Shaftesbury Ave at 13h. Come on down and say hi! The UK edition of Rapture of the Nerds hits shelves on April 12, but we’re having a sneaky early release at Forbidden Planet in London on Mar 23 at 1PM. Tell your friends! (I’m pretty sure that Forbidden Planet will take advance mail-orders for people who can’t make it, and I’ll sign and personalise every one of ’em). Locus magazine has just released its 2012 Recommended Reading List of science fiction/fantasy/horror, which is always a great reading guide (and a fabulous resource for those of us nominating for the Hugo awards. I’m delighted to see my novel Pirate Cinema and Rapture of the Nerds (written with Charlie Stross) on the best novel list! How awesome is this cover for the forthcoming UK edition of Rapture of the Nerds? Nominations are open again for science fiction’s Hugo Awards — if you attended last year’s WorldCon or have supported/bought a membership for this year’s con, you get a vote. There’s a lively LJ group discussing potential nominees (I often wait for the annual Locus Magazine best-of list to use as a crib for my nominations). My own eligible works are two novels: Pirate Cinema and Rapture of the Nerds (with Charles Stross), both from Tor Books. Here’s Charlie Stross’s list of eligible works, and here’s a wider list instigated by John Scalzi. Feel free to leave your favorites (or own eligible works) in the comments here.